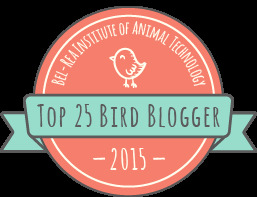 I realized recently that I neglect to write about the birds in my own backyard. I guess this is because it is usually the same-old-same-old with cardinals, chickadees and sparrows. Well, that certainly isn't the case lately. 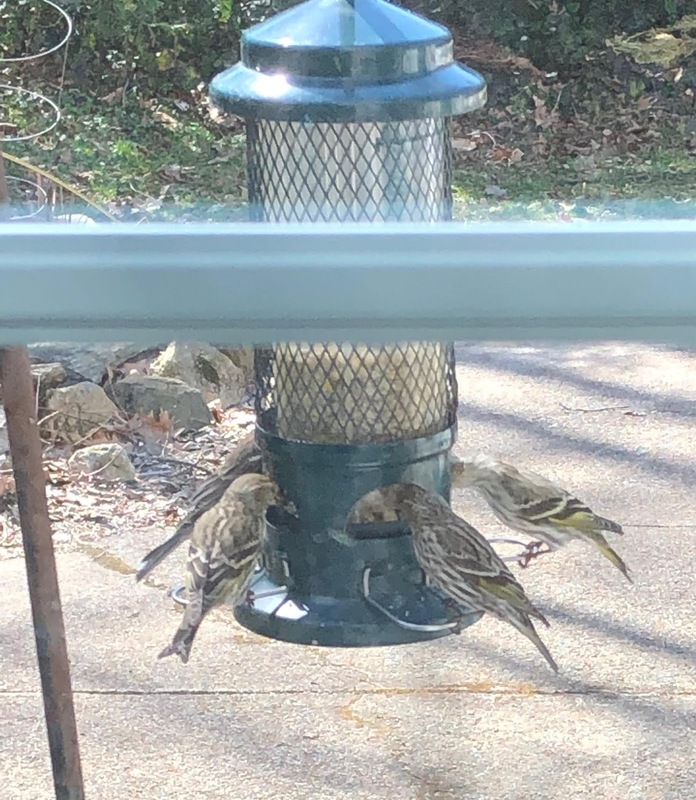 I think I am one of the only birders in the area who has Pine Siskins visiting my feeders. I've had them for a few months. A high count of 6 during one of the snow days in January. 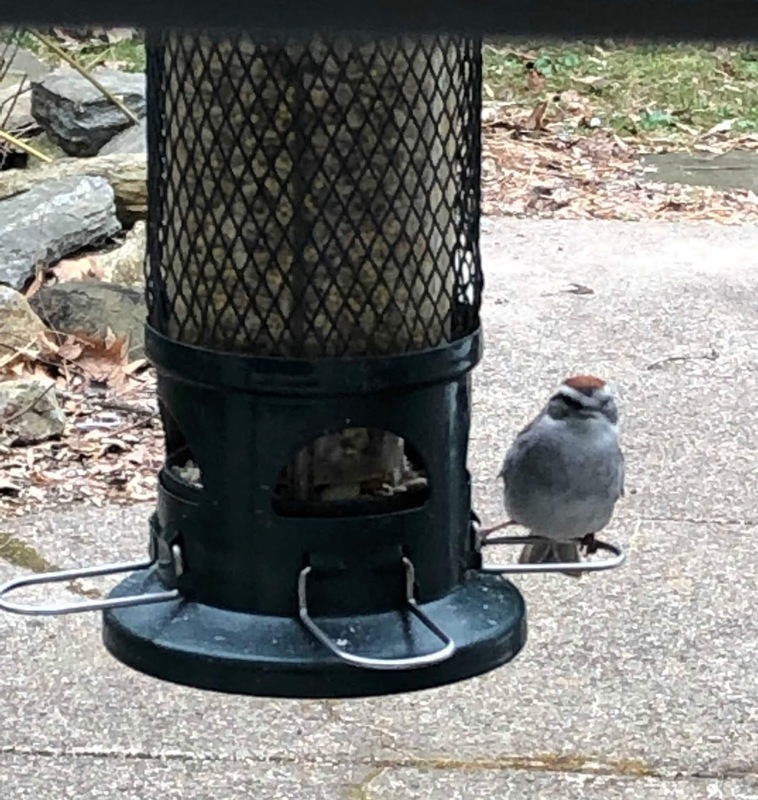 They are still hanging around and have been really hitting the bird seed hard this week. I think they may be fueling up to head north back into Canada soon. They are sure cute little buggers. Pine Siskins regularly mix in with Gold Finches. You can tell them apart easily. The Siskins are always streaky with a very thin bill. Some of them show yellow patches on the wings. You can see that on the right side bird above. Meanwhile, Goldfinches are not streaky. They are solid yellow with black wings most of the year. Take a look at the bird on the right below. 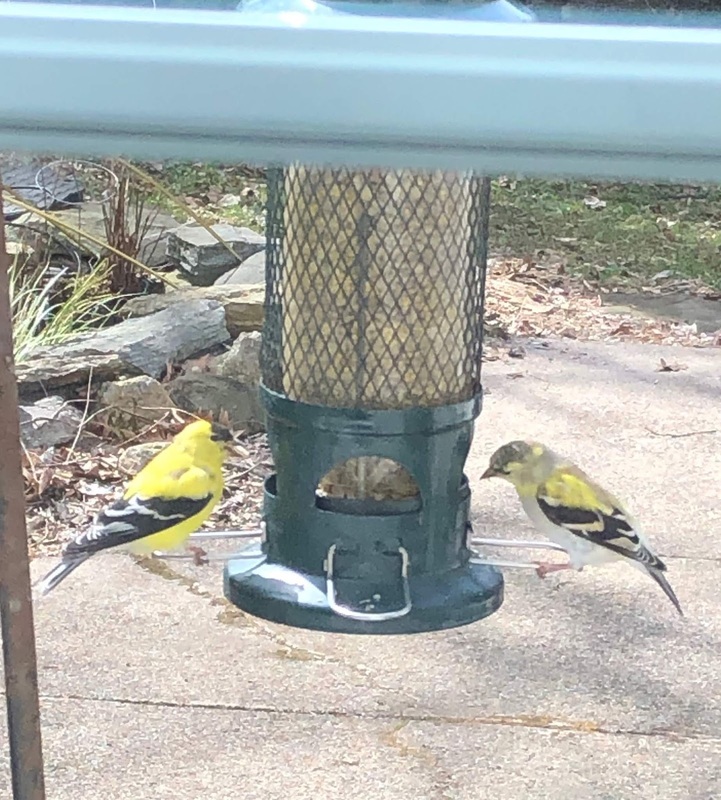 This bird is in full molt going from dull gray to full yellow like the bird on the left. 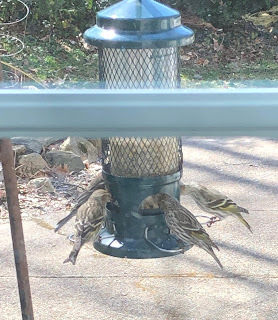 So, Siskins are fueling up to leave. Goldfinches are molting into their new breeding plumage. And at the same time, some birds are arriving from the south including Chipping Sparrows. They usually show up on tax day but this guy is early. Brown-headed Cowbirds also arrived this week. Not that I like having them around since they lay eggs in the other birds nests but they are pretty to look at. All photos taken with iPhone out of my office window, so not that great. Interesting times in the yard also include frogs emerging from hibernation in the pond. Spring is here!